Removing "Boss" and "World Boss" from the rares. When tracking rares that have been killed already, the Addon will show an additional icon for the rare. Rares are now tracked over achievements. Does the Discovery track still work? I have it installed, it tracks rares, but after adding Discovery to the list (which shows up in orange on the list) I have yet to have it indicate one & I have come across 3 so far. I am having an issue with the option to track bosses we already have killed. I cannot get it to stick. I check the box, but when I close the options window and open it again, it is unchecked again. I am also sure this is not a visual issue, as I was in front of a rare mob and it was not being tracked. Nothing I do allows me to track all rare mobs regardless of whether they have or not been killed. I use no other addons outside of the default carbine ones, so there is no interference. Do I have to install an older version? Do you need any further information for diagnosis? This started once I upgraded version. I tried deleting the files, including the individual files for each character in the %appdata% directory, and nothing has any effect. 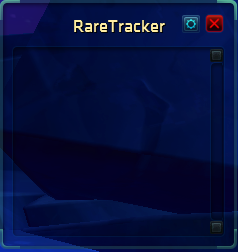 In addition, hovering over the "track killed rare" checkbox, I get the tooltip "broadcast to party chat when a rare is detected" exactly the same as the checkbox above that does this. Any help is greatly appreciated, otherwise I will have to revert to a previous version (assuming those still can be downloaded). Why i can't delete killed creatures from the list? 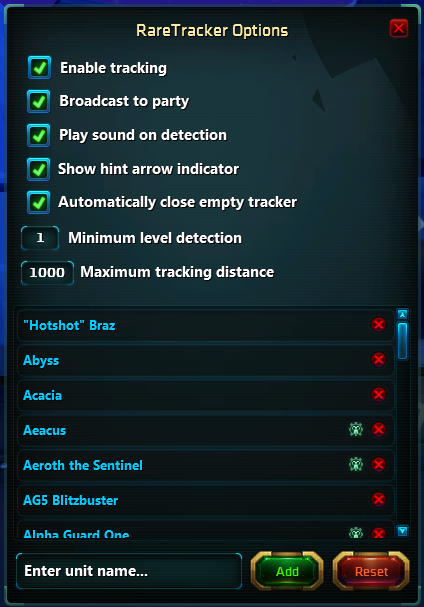 They appear again after reloadui or changing zone..
because I do not track what you've already killed. For that I would have to track a list of killed rares, or cross check with the addons. Tried to remove "Grinder" from the list (because despite it being a rare in Crimson Badlands, it's a common in Thayd), and it STILL calls out every single time. How the heck does it still see Grinder, when I've removed the entire word from the LUA?? most likely due the mob being saved in your AddonSavedData. The Addon always reloads those lists when it finds it, so you will probably have to delete the stored data for RareTracker. I will push out an update soon that will check whether the target is attackable by the player when it's one of the standard mobs. Just started using this, and it's aswesome... but it seems to make it so the little information window on the side does not open when hovering over datacubes and stuff. Can you make a screenshot of that, and report it on the issue tracker? I'm not really sure what you are referring too, but if it's really a bug, then it needs fixing. Please open an issue for this on the Github tracker so I can look into it. Please add support for Perspective. Much better than TrackMaster imo. That is a fairly large request, but I will make note of it and see if it can be done. Can you add all the exotic executioner mobs? You can do this yourself, by using the RareTracker button from the main menu, and adding the mob names as custom rares to be tracked. yea i did it myselft but when I turn the addon off all my settings are lost. And also it would be awesome if I could remove the names of rares I already killed with the red X, it worked in the past what happened? too much work sorry to track these changes. Perhaps in a future version, but not right now. Update with v2.0.3: It is finding the Grinder Mount that is standing on display behind the Hoverboard Flair Imports Vendor. In south of Thayd.